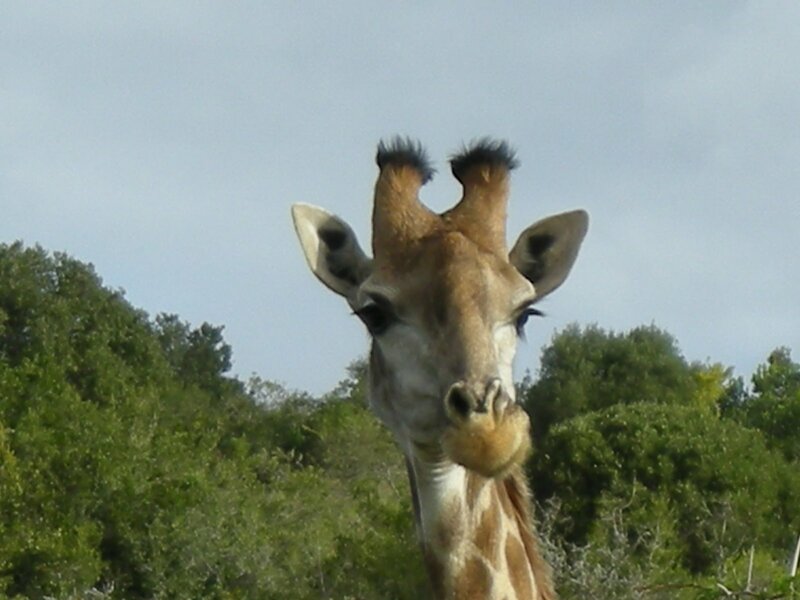 One of Knysna's biggest tourist attractions, the Featherbed Nature Reserve, just announced it long-awaited re-opening. The privately-owned Nature Reserve, situated on the Western Head in Knysna, is set to open again on 15 October 2018. The Knysna Fires of 2017 destroyed about 90% of the vegetation in the Nature Reserve, with only patches of forest and scrub left uncharred. The owners therefore decided to close the Featherbed Nature Reserve so that the eco-system had time to recover. Zambia: Devil's Pool on Livingstone Island has been reopened! The famous Devil's Pool, a rock pool right on the very edge of the mighty Victoria Falls on Livingstone Island (Livingstone side of the Falls in Zambia), has been reopened for tours on 30 August 2018. Also known as the "Armchair" or simply the "ultimate infinity pool", Devil's Pool is only accessible during the drier month of the year when the Zambezi River drops quite substantially (low water season). This usually takes place from mid-August to mid-January. Livingstone Island, which is located in the middle of the Zambezi right on the edge of the Victoria Falls just before the water thunders down a 103 metre drop, is a protected area that is only allowed a maximum of 24 people on at any one time. 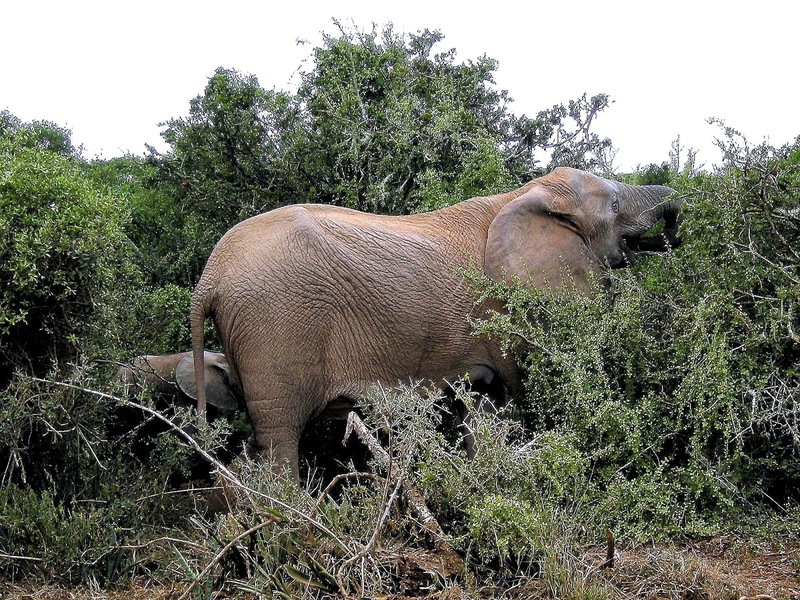 Addo Elephant National Park: Zuurberg horse trails closed until further notice! South African National Parks (SANParks) announced some days ago that the Zuurberg horse trails in the Zuurberg Mountain section of Addo Elephant National Park in South Africa's Eastern Cape are closed until further notice. The Nyathi horse trails ("Addo Horse Trails"), which depart from Addo Main Camp and take place in the Nyathi area of the National Park, remain open and are commencing as normal. South Africa's third largest National Park, the Addo Elephant National Park, is located about 80 km from Port Elizabeth in the country's Eastern Cape. The National Park is home not just to the famous BIG FIVE, but to the BIG SEVEN - elephant, buffalo, rhino, lion, leopard, great white shark and southern right whale. Travel alert: Pide of lions in Kruger National Park shows abnormal behaviour around vehicles! SANParks encourages visitors to Kruger National Park, who might have taken photos/video or have feedback on the pride, to share or post these on SANPArks social media platforms. 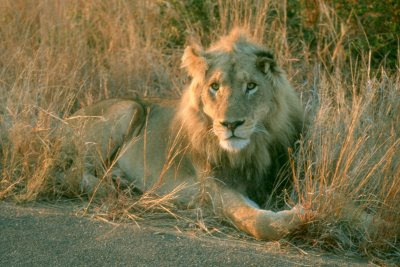 This allows Kruger National Park's management to try to identify whether it is only a specific member of the pride or whether the entire pride has developed this behaviour. The National Park's Veterinary Wildlife Services will be collaring a member of this pride to monitor movements and will also mark all members of the pride to allow for identification. The Zeitz MOCAA, located in the V&A Waterfront, was recently named of one of Time Magazine's "World's Greatest Places". The museum building was constructed from the conversion of the 57m tall historic Grain Silo. The 9,500m² complex consists of nine floors with 6 000 m² dedicated to gallery spaces and 3 500 m² to site specific exhibition spaces. The Zeitz MOCAA was opened in September 2017. Johannesburg: Kaserne Bridge (M2 freeway) closed until end of 2019! The Kaserne Bridge on the M2 freeway in Johannesburg is closed from today (27 August 2018) until the end of 2019 due to major cracks on the road that need to be repaired. The M2 east is blocked off between the Joe Slovo off-ramp and Maritzburg road. The motorway is a critical route in the Johannesburg road network and authorities have advised motorists to use alternative routes. The M2 ("Francois Oberholzer Freeway") runs just to the south of Johannesburg's Central Business District (CBD) eastwards where it connects with the N3 (only a short segment goes to the west of the CBD). The north-south M1 intersects with the M2 just to the west of the CBD. TAAG Angola to increase flights between Luanda <> Maputo! The state-owned national airline of Angola, TAAG Angola Airlines, is set to increase flights between Quatro de Fevereiro International Airport (LAD) in Luanda and and Maputo International Airport (MPM) in Maputo during the Northern winter season 2018/19. From 30 October 2018, the airline will increase the number of flights from the current three weekly flights to five weekly flights. The additional services will be operated in the evening/overnight on board a Boeing 737-700. South African Airways to increase flights between Johannesburg <> Luanda! South Africa's flag carrier, South African Airways, is set to increase the number of flights between OR Tambo International Airport (JNB) in Johannesburg and Quatro de Fevereiro International Airport (LAD) in Luanda. From 09 September 2018, the airline will operate this route four times a week, instead of two. The two additional weekly flights will be operated during overnight hours. As with the exisiting flights, South African Airways will service the route on board an Airbus A320 aircraft. Earlier this month, the state-owned national airline of Angola, TAAG Angola Airlines, announced that it will increase flights between Quatro de Fevereiro International Airport (LAD) in Luanda and OR Tambo International Airport (JNB) in Johannesburg during the Northern winter season 2018/2019 by introducing a new evening service. Five destinations in Southern & East Africa made it to list of the "World's Greatest Places 2018"! The famous Time Magazine, an American weekly news magazine and news website, has released its first annual list of the "World's Greatest Places". Based on certain key factors, such as quality, originality, innovation, sustainability and influence, the list showcases 100 destinations from six continents and 48 countries. Four destinations in Southern Africa and East Africa made it to Time Magazine's list of the "World's Greatest Places", namely the Zeitz MOCAA in Cape Town (South Africa), the Giraffe Manor Hotel in Nairobi (Kenya), the Bisate Lodge in Volcanoes National Park (Rwanda), the King Lewanika Lodge in Zambia's Liuwa Plain National Park as well as the brandnew Shipwreck Lodge in the Skeleton Coast National Park in Namibia. Congratulations! 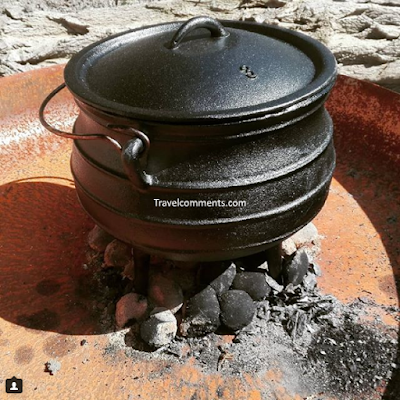 Potjiekos is a traditional South African way of cooking in a in a round, cast iron, three-legged pot (the potjie), over small amounts of wood or charcoal. Cooked always outside, potjiekos is almost as popular amongst South Africans as the legendary braai. One of my personal favourites is oxtail potjie - a hearty, rich and slow cooked stew of meltingly soft oxtail on the bone, vegetables, mushrooms and red wine. Wipe the oxtails dry with a paper towel. 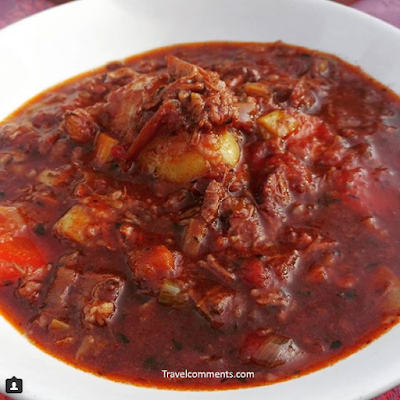 Put flour, salt, paprika, coriander and pepper into a plastic bag and toss together with oxtail pieces so the meat is evenly coated. Retain seasoned flour left in the bag in case you need to thicken the stew later. Prepare a direct fire and make sure you have hot coals for the start of the potjie. Heat the vegetable oil in the potjie and sauté bacon cubes. Remove bacon, add the oxtail to the pot and brown in the bacon fat. When each piece is browned all over, remove and drain on paper towels while keeping warm. Add onion and garlic and fry for a few minutes until just turning brown. Bring slowly to the boil. Cover tightly with a lid and allow to cook undisturbed for 5 hours. Add leeks, carrots, mushrooms, potatoes and continue cooking slowly, without stirring, for another hour. Kruger National Park: Numbi Gate inaccessible due to protests! According to a press release by South African National Parks (SANParks), Kruger National Park's Numbi Gate is currently inaccessible due to protests taking place outside the gate (on the Numbi road bridge leading to the gate) and is blocked at the moment. Guests are advised to use alternative gates such as the Phabeni Gate or the Paul Kruger Gate to access or exit Kruger National Park until further notice. We'll keep you posted! How to claim back VAT at South Africa's three major airports! Only original tax invoices will be considered for a refund! 2. On your departure from South Africa, you must present the actual goods and tax invoices for inspection to a VAT Refund official or a South African customs official in the departure hall before checking in for your flight. In case your purchases do not fit into your hand luggage, you must present the goods and the tax invoices at a VAT Refund or a South African customs inspection desk prior to check-in. The VAT Refund official or South African customs official will stamp all tax invoices that quality for a VAT refund. 3. Present your claim at the VAT Refund Office. You will need your passport, boarding pass and your tax invoices (they need to be stamped by a VAT Refund official or South African customs official!). Your VAT refund claim will be processed and you will be issued with a VAT REFUND CARD which, once loaded with your VAT refund, may be used to make purchases or withdraw cash from any ATM wherever the MasterCard® Acceptance Mark is displayed (excluding the common monetary area being South Africa, Namibia, Lesotho and Eswatini/Swaziland). For more info regarding the VAT REFUND CARD click here. For more information about the VAT Refund in South Africa please visit www.taxrefunds.co.za.! Mozambique: Africa's largest suspension bridge to be completed in October 2018! According to Mozambique's Minister of Public Works, Housing and Water Resources, João Machatine, the Maputo-Catembe bridge (or Maputo-Katembe bridge or Maputo - Ka Tembe bridge), which connects Maputo with Catembe by crossing the Maputo Bay, will be ready by the end of October 2018. The official opening of Africa's largest suspension bridge has been postponed several times since December 2017. The Maputo-Katembe bridge is about three kilometers long, has a width of 680 metres and stands 60 metres above sea level. It forms part of a larger infrastructure project that includes a set of access roads on both banks and other roads. 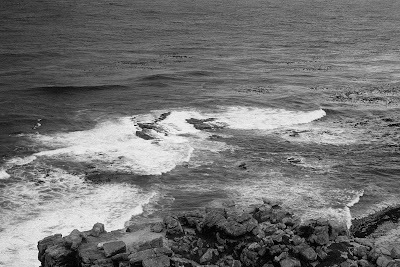 One of the adjoining roads links the bridge with the Ponto de Ouro border post (Mozambique) and the Kosi Bay border post (South Africa), which cuts the driving time from Mozambique's border with KwaZulu-Natal to Maputo by about four hours. Kruger National Park: Masorini Heritage Site temporarily closed! South African National Parks (SANParks) has informed the public that the Masorini Heritage Site in Kruger National Park is temporarily closed until further notice due to an infrastructure upgrade. The late Iron Age site is located on a prominent hillside just 12 km from the Phalaborwa Gate on the tar road to Letaba Rest Camp (39km from Letaba on the Phalaborwa road). Masorini used to be inhabited by the Sotho speaking BaPhalaborwa during 1800s, who developed an advanced and sophisticated industry of mining, smelting iron ore and trading in these iron products. The site has been reconstructed as truthfully as possible. It includes reconstructed huts and furnace, a site museum as well as a picnic area at the foot of the hill. Guided tours are available. update (16 April 2019): Kenya Airways has reached an agreement with Delta Air Lines to activate its codeshare in the US and Canada. The arrangement will enable travelers to connect from New York, using the direct flight from Nairobi, to other cities within the US and Canada opening many more opportunities at more competitive fares. Kenya's flag carrier, Kenya Airways, and American airline Delta Air Lines, both members of the SkyTeam alliance, have entered into a codeshare partnership on flights to and from Kenya Airways' hub at Jomo Kenyatta International Airport (NBO) in Nairobi. Under the codeshare partnership, Delta Air Lines places its code (DL) on Kenya Airways' flights from Amsterdam, Paris, London, and Accra to Nairobi, enhancing connectivity and providing customers with a one-stop seamless travel experience from the USA. In addition, Delta Air Lines also places its code (DL) on Kenya Airways' services to more than 10 key cities across Africa, including: Addis Ababa, Lilongwe, Maputo, Johannesburg and Djibouti City. The new agreement became effective on 11 August 2018. The Tanzania-Zambia Railway Authority (TAZARA) has announced that it will adjust passenger fares for the TAZARA Railway in Zambia. The adjustment will erase the disparity between fares paid for in Tanzanian shillings (TSh) and fares paid for in Zambian Kwacha caused by continued depreciation of the Zambian Kwacha relative to the Tanzanian shilling (TSh). The new fares, as indicated in the schedules for both Express and Ordinary passenger trains in Zambia, will become effective from 17 September 2018. South African state-owned regional airline SA Express just announced that it will resume operations on 23 August 2018. The airline was grounded by the South African Civil Aviation Authority (SACAA), the national aviation authority of South Africa, in May 2018. In June 2018 SACAA reinstated SA Express' Air Operator Certificate (AOC) and Aircraft Maintenance Organisation (AMO) approval as well as Certificates of Airworthiness (CoA) for two of the carrier's aircrafts. Subsequently in July 2018, the airline announced that it was readying itself for take-off. In the meantime most of SA Express' eleven aircrafts received their CoA back; the remaining fleet is expected to be cleared for take-off soon. TAAG Angola to increase flights between Luanda <> Johannesburg! The state-owned national airline of Angola, TAAG Angola Airlines, is set to increase flights between Quatro de Fevereiro International Airport (LAD) in Luanda and OR Tambo International Airport (JNB) in Johannesburg during the Northern winter season 2018/2019 by introducing a new evening service. Effective 28 October 2018, the airline is going to operate 13 weekly flights instead of the current seven weekly flights on board a Boeing 737-700 between the two destinations. Ethiopian Airlines to launch seasonal service to Lisbon (Portugal)! The flag carrier of Ethiopia, Ethiopian Airlines, will launch a seasonal service between Bole International Airport (ADD) in Addis Ababa and Humberto Delgado Airport (LIS) in Lisbon via Adolfo Suárez Madrid–Barajas Airport (MAD) in Madrid on 28 October 2018. The airline will operate four weekly flights on Mondays, Wednesdays, Fridays and Sundays on board a Boeing 737 Dreamliner on the new route. The service will initially run until 29 March 2019. Ethopian Airlines has ended its service between Addis Ababa and Barcelona via Madrid today (15 August 2018). Rwandair to increase flights to Europe in December 2018/January 2019! Rwanda's flag carrier, Rwandair, is set to increase its service between Kigali International Airport (KGL) in Kigali and Gatwick Airport (LGW) in London via Brussels Airport (BRU) in Brussels during the 2018/19 European winter peak season. According to aviation specialist Routes Online, the airline will operate an additional flight on board an Airbus A320 on Fridays from 14 December 2018 to 17 January 2019. Gauteng's commuter rail system Gautrain, which connects Johannesburg, Pretoria, Ekhuruleni and O. R. Tambo International Airport (JNB), has announced that the strike* has ended. The full services will resume on 15 August 2018. In the meantime, the reduced service that is currently operational will be further enhanced for today (14 August 2018). Marlboro station will be opened and trains will operate between Hatfield station and Park station during peak (every 15min) and off-peak (every 40min). The airport service will operate during peak and off peak (every 20 min) and trains will travel between Sandton station and O. R. Tambo International Airport (JNB), stopping at Marlboro station and Rhodesfield station. All bus routes will be operated during peak and off-peak. Air Seychelles increases capacity to Johannesburg during peak seasons 2018/19! The national airline of the Seychelles, Air Seychelles, will increase the frequency of its services between Seychelles International Airport (SEZ) on the island of Mahé near the capital city of Victoria and OR Tambo International Airport (JNB) in Johannesburg during the Christmas/New Year season 2018/19 and the Easter holidays 2019 to accommodate the growing demand. The additional services will be operated on board an Airbus A320 on Mondays and Fridays during the peak holiday periods between December 2018 and April 2019. Ethiopia: Ethiopian Airlines to suspend flights between Addis Ababa <> Barcelona! The flag carrier of Ethiopia, Ethiopian Airlines, is set to suspend its service between Bole International Airport (ADD) in Addis Ababa and El Prat Airport (BCN) in Barcelona via Adolfo Suárez Madrid–Barajas Airport (MAD) in Madrid from 15 August 2018. The airline launched the service to Barcelona only on 01 July 2018. According to Ethiopian Airlines, the decision to terminate flights to the Spanish city was made due to operational difficulties. The airline will continue to operate four weekly flights between Addis Ababa and Madrid. Malawi: Malawian Airlines increased flights to various destinations in July 2018! The flag carrier of Malawi, Malawian Airlines, increased frequencies on various routes in July 2018. The airline now offers seven instead of four weekly flights between Chileka International Airport (BLZ) in Blantyre and Julius Nyerere International Airport (DAR) in Dar es Salaam, four instead of three weekly flights between Blantyre and Jomo Kenyatta International Airport (NBO) in Nairobi as well as three instead of two weekly flights from Kamuzu International Airport (LLW) in Lilongwe via Robert G. Mugabe International Airport (HRE) in Harare to Kenneth Kaunda International Airport (LUN) in Lusaka. The return flight from Lusaka via Harare to Lilongwe remains a three-weekly service.